I try not to ask much from you, but this is a time where I feel I must. I got my start in journalism at The Eagle, American University’s student newspaper since 1925. I took every assignment I could get my hands on and eventually from there became a Student Government beat reporter. They liked me enough to give me a section editing position and finally editor-in-chief. The Eagle taught me everything I needed to know in order to be a journalist in Washington, D.C. Journalism can be a force for good at American University, and The Eagle has worked to that promise. In my four years there, the journalists at The Eagle have uncovered: the history of WWI-era chemical munitions buried in the grounds of AU’s land, the then-unannounced-but-already-decided smoking and tobacco ban, an investigation of fraternity hazing, lobbying efforts by the university on Capitol Hill, how local laws affect students, lawsuits and so, so much more. At the same time, the staff dutifully dropped papers and homework to cover breaking news, which has included everything from gunmen to rallies. The Eagle has been on the forefront of sports and A&E coverage on campus and gives young journalists the opportunity to cover the events in Washington alongside professional journalists. It has won more awards from the Society of Professional Journalists than I can remember, and Eagle staffers every year win scholarships through outside journalism organizations. They serve in internships at national and local news organizations and graduate to become major newsmakers and storytellers. Alumni of The Eagle currently work at The Washington Post, USA Today, NBC, Turner, the White House and more. The Eagle has tirelessly worked for the American University community. Now it needs your help. The Eagle’s financial stability, like that of countless other newspapers across the country, is in question. Declining advertising revenue forced The Eagle to lose its weekly print edition last year. The staff has adopted a digital-first approach and is making money with a redesigned website in cooperation with the Student Media Board. The burdens this placed on the staff should have been greater and was only lessened by their untiring dedication to journalism on campus and the generous support of alumni. But there’s work to be done. To ensure The Eagle has the funds every year to innovate and provide the journalism AU needs, and the training its staff needs to compete in the global workforce, it needs more than just advertising revenue and allocations from AU. Enter The Eagle Innovation Fund. If we raise $10,000 by April 25, the university will set up a permanent endowment, the interest from which will fund The Eagle in the years to come, allowing its journalists to focus on the business of journalism rather than on the business of making money. If you care about journalism on campus and across the country, here is one place where your donation, as big or as small as it needs to be, will make a difference. Help The Eagle do what it has proven it can do: Shine a light on AU and train journalists to report on the world. If you know somebody who lost their job in journalism despite all the work they did..
You know what it takes to make journalism happen. Help us continue to do it. Donate today. I wish I could have written about Bill Irwin on a happier occasion. I read his book years ago and still treasure my copy signed both by Irwin and his guide dog, Orient. Irwin passed away earlier this month of prostate cancer. At the age of 50, he was the first blind man to traverse the entire 2,100-mile Appalachian Trail from Maine to Georgia. His story as a recovering alcoholic looking for faith in God was an inspiration to many across the country. Found this obit that was apparently published almost two weeks ago. From speaking with his daughter, I could tell Martin E. Sloane was really passionate about the cause of fair housing and civil rights, even in retirement. This post was updated March 18 with the print clip. 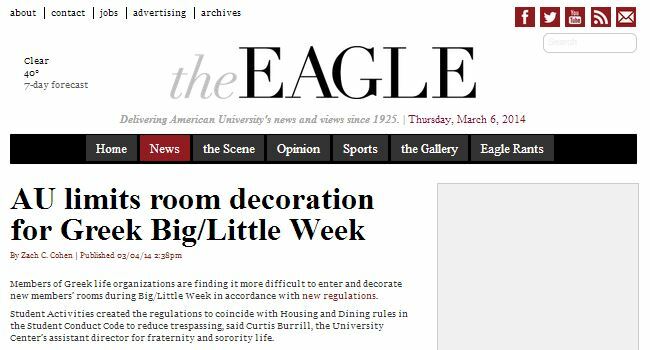 Members of Greek life organizations are finding it more difficult to enter and decorate new members’ rooms during Big/Little Week in accordance with new regulations. Student Activities created the regulations to coincide with Housing and Dining rules in the Student Conduct Code to reduce trespassing, said Curtis Burrill, the University Center’s assistant director for fraternity and sorority life. Read the rest of the story at The Eagle, which includes interviews with student leaders in Greek life on the changes to a longstanding AU tradition. Back in January, I had the opportunity to get to know the members of the Second Monday Book Club, which celebrated its 40th birthday late last year. The piece is now published by Current Newspapers, a local chain of four newspapers in Washington, D.C., in their “Senior Living” section. 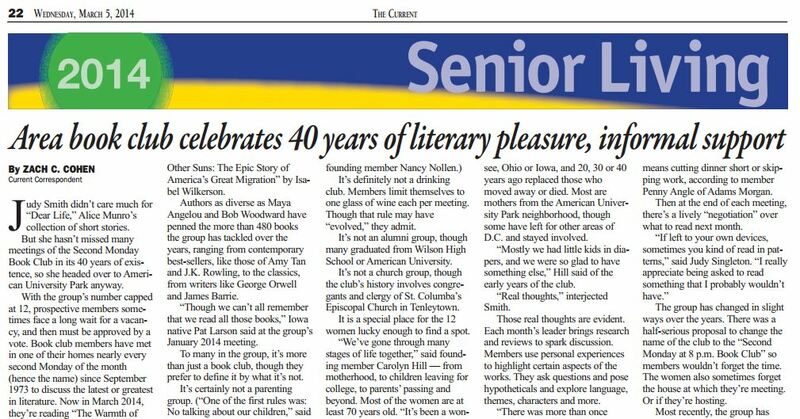 Check out the story on page 22 of the Northwest, Georgetown, Dupont and Foggy Bottom editions. Thanks to managing editor Chris Kain and staff writer Graham Vyse for helping make this happen. Additional thanks to Brady Holt and Beth Cope at Current for providing valuable feedback and copy editing. In case you hadn’t heard, if you live in certain parts of DC, it is currently unsafe to drink the water. 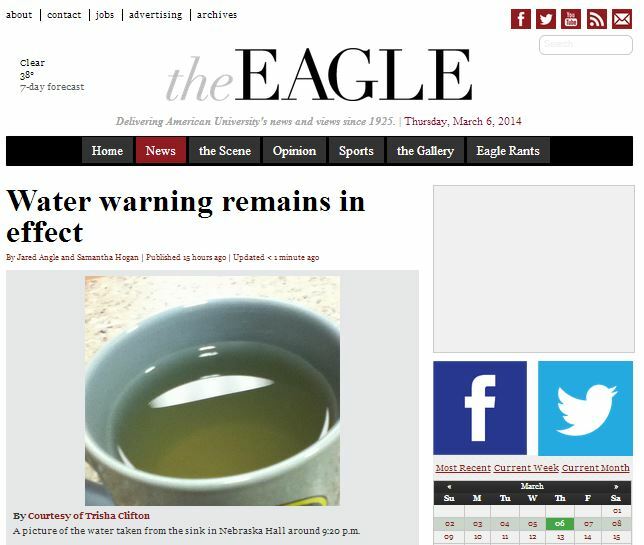 Follow The Eagle for all the latest news on the water situation. I’ve been contributing reporting remotely (where it is safe to drink the water). I did some reporting on road and sidewalk conditions in Northwest Washington during a snow storm in February. Turns out my colleagues at The Washington Post were able to put it to good use. I got two contributing tags Feb. 5. My latest for Latin Pulse in this week’s newscast is my report from the release of a new book by Guillermo Valdes Castallanos, the former director of the Mexican intelligence agency (CISEN). Organizing the event was Manuel Suarez-Mier, a former Mexican diplomat and my professor for “World Politics” at American University. Mexican Ambassador to the United States Eduardo Medina Mora was also there.